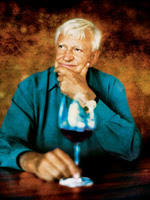 Jess Jackson was a giant in the wine industry, and a deserving member of the Vintners Hall of Fame. I could write a long obituary about how he built an 5-million case winery from the ground up, vertically integrating everything, and insisting on high quality in every area. But I suspect the major newspapers and wine publications will have that covered. I want to tell a small story about Jess, about a side of him that most people didn't see. There's a tiny family winery in an unfashionable region in France, where the young siblings who took over were enthusiastic about the potential of their region. Jackson, on a trip to France, somehow came to taste the wines and meet the owners. I don't know how that meeting came about -- I'm sorry, because that's probably the best part of this anecdote. But in any case, Jackson pledged to help them transform their estate by selling their wine for them in the United States. Jackson put the resources of his wine company at their disposal, including his winemaking consultants and his marketing team; the wines got cool, modern-looking labels. And the wines were really good. The easiest thing to do for Jackson would have been to walk away. It wasn't his winery. They weren't his family. He tried to help them, and it wasn't his fault that the wines didn't sell. But Jess had given his word. So his import company continued to buy several vintages of the wines even though previous vintages were backed up in the warehouse. This would enable the family to pay off loans they had taken on new equipment they needed to transform their lives. There was a business meeting one day between Jackson's folks and a company that offered to get rid of these wines cheaply -- blow them out at a low price. By this time the unsold wines were a headache, and Jackson's business might have been best served by putting them on a flash site, taking a writeoff and moving on. Jackson knew that, eventually, he would have to walk away from the French family's wines. He had already paid for his stock and could in perfectly good conscience do whatever he wanted with it. His concern was for the young French family's future; if their wines were established as $15 wines, no future importer would ever handle them because it would be impossible to make money. Jackson wanted the wines in the public eye, and he wanted retailers to have incentive to hand-sell them. And he wanted to protect the price point. That's a lot to ask, and impossible to do profitably for the company holding the cases. So he willingly took a huge loss, giving a healthy profit to the middleman and an even healthier one to retailers. With anyone who runs a big business, there will be stories of ruthless business behavior. Jackson seemed to generate those more than others, particularly when he was starting out in the 1980s. Much of his push to vertically integrate his wine business came from the sense that the old-boys' club of suppliers was giving the new lawyer guy a hard time on deals. I also heard him talk about that with the horse-breeding business; that the system was set up to reward insiders, and he had to fight it at every step. As I said, there will be more complete obituaries of Jess Jackson elsewhere. I'm not going to attempt to put him in perspective, dealing with my own sadness today in losing a member of the Vintners Hall of Fame. Just two months ago, we were all touched when Jackson showed up at this year's induction ceremony. He had become so frail that he barely went anywhere but his home or the hospital, but he told the first person he saw at the ceremony that he just couldn't miss it. I will remember the Jess Jackson who befriended a family, made them a promise, and stuck to it, even though it cost him a lot of money. In many encounters Jackson was the ultimate lawyer, carefully parsing the language of contracts and seizing on advantages. But in his heart, Jackson had the capacity and the desire to do business with a handshake, and he was a man of his word. We'll miss you Jess, but we won't forget you. Thanks for this, Blake, believe me, it wasn't unique. There were many facets to this diamond, many to be quietly admired and treasured on their own, just because. Not sure that the Grey Market Report could have handled this any better. Nice article, but apparently I am a dope; what exactly did Jess do with this wine, in the end? Thanks! Blake, a fine story to mark his passing. Thanks for telling it. Steve: He gave it to a middleman for a really low price. He could have sold it for more than twice as much, maybe three times as much, if he hadn't insisted on retail stores as opposed to flash sites. He didn't want the wine to disappear; he wanted to put it in front of people. All of that might make some sense marketing-wise if you stand to profit long-term, but Jess didn't in this instance. Thanks, W., that makes sense.